America's Sweethearts NYC - Singing group in New York City, NY. The most diverse city in the world, New York is home to a wide array of cuisines and culture. In the city that never sleeps, the simple act of strolling down the street is, in fact, a voyage of discovery. And, if you're really lucky, you might just catch an acapella group vocalizing their heart out on a nearby street corner. The spirit of Dion and the Belmonts is still alive and well, from Arthur Avenue in the Bronx to Times Square. If you can imagine it, you'll find it somewhere in New York. Yes, the Big Apple's chefs, artists and musicians are into innovation and setting trends; not following them. But every once in awhile, it's good to return to one's roots, especially when it comes to old family recipes or time-honored musical traditions. There's a young, vibrant group of talented singers, based in Astoria, Queens, who infuse America's traditional songbook with their own particular brand of energy and enthusiasm. Led by entertainer extraordinaire Carly Kincannon, the groups' name is America's Sweethearts and they are all about history through harmony. The founder and musical director of America's Sweethearts, Carly has brought together some of the most talented and beautiful voices and personalities that the ultra-competitive NYC music scene has to offer. Through their uplifting music and intricate, soaring harmonies, the goal of America's Sweethearts is to spread nostalgia, joy and human connection one great song at a time. 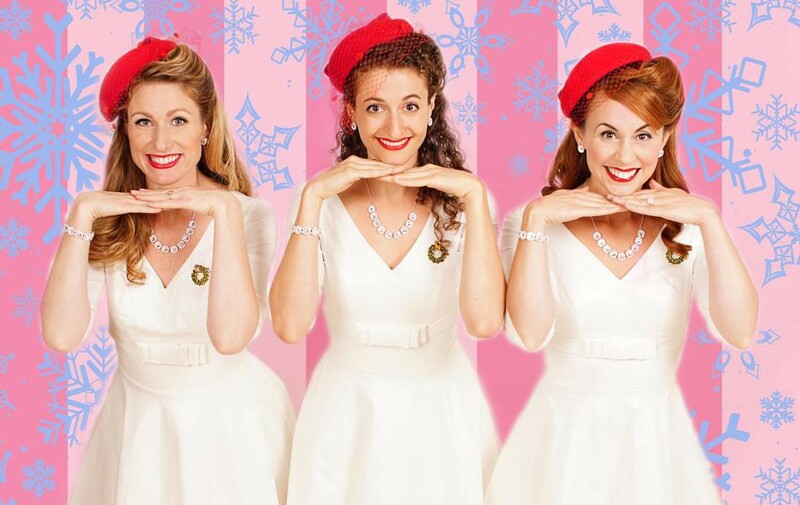 Inspired by the timeless appeal of the legendary singing group, The Andrews Sisters, Carly set out to pay homage to these classy ladies, as well as their era in American pop culture. But the Sweethearts are not just a "tribute" band, as it were. Not by a long shot. Carly and her musical colleagues have infused standard songs that you have heard time and again, like Sing Sing Sing and Boogie Woogie Bugle Boy, with freshness and a style that's all their own. A collective of ten amazing, multi-talented women, America's Sweethearts performs as a trio at most events. 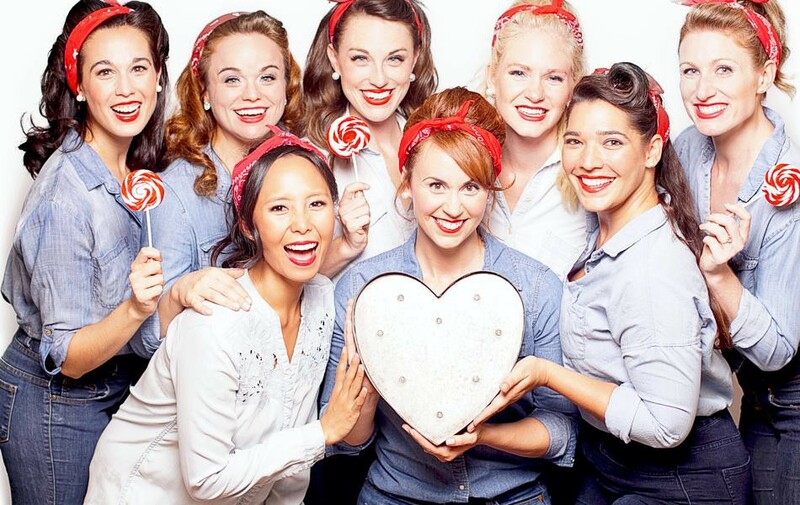 The Sweethearts are honored to have been asked to perform at the Memorial Day celebrations on board the USS Intrepid Sea, Air and Space Museum. Performing on the massive flight deck of this aircraft carrier, which saw its' fair share of action during World War II, the Sweethearts wowed the assembled crowd of veterans, their families and various dignitaries, with rousing renditions of hits by the Andrews Sisters and other patriotic songs from that era. Dressed in vintage hairstyles and costumes, the Sweethearts looked as though they just got off the plane from a stop on one of Bob Hope's USO tours. This is Americana at it's finest! 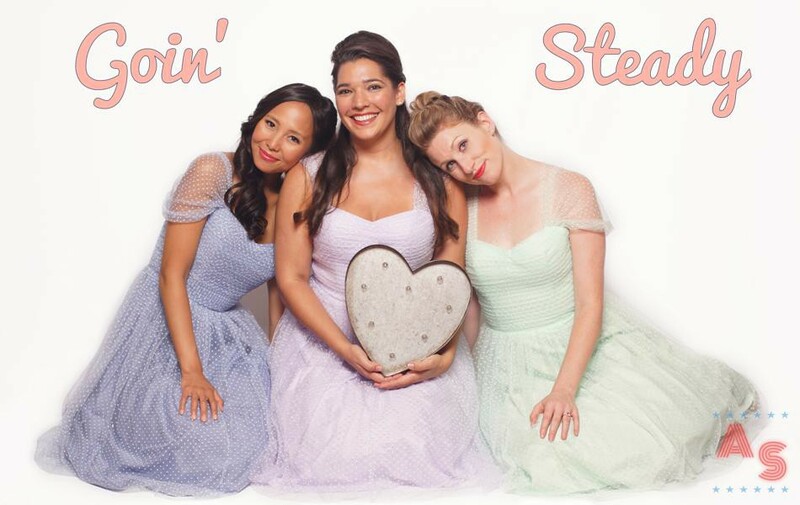 No matter what era of musical history you're into, the Sweethearts have got a show for you! With up to ninety toe-tapping minutes of material, Sing Sing Sing takes you through the 1930's and 40's, which was the time when the big bands reigned supreme, from Glen Miller and Count Basie to Duke Ellington. The fabulous fifties and swinging sixties rolled out one song after another about the joys (and sadness) of falling in and out of love. From Disney's first pop star Annette Funicello to Diana Ross and the Supremes, The Sweethearts will take you on a roller coaster ride of emotion in their show entitled Going Steady. One of their most popular shows is Broadway Tonight, a one of a kind musical performance that features the entire Sweethearts group plus some very special guest stars. As Carly and the Sweethearts sing their hearts out, you'll feel as though you are watching a private VIP show on the Great White Way. Their song list is comprised of the most memorable numbers from hit Broadway musicals. Your favorite song is sure to be included. if not, all you have to do is ask! The Sweethearts have recently added a truly spectacular Home for the Holidays show. This joyful performance will get you into the festive, holiday spirit in no time at all. You will be singing along to the group's heartwarming renditions of classics such as Sleigh Ride, Let it Snow and The most Wonderful Time of the year. Carly and company are always seeking to challenge themselves and regularly come up with new themes for shows. There's not a tune that they can't sing, so check back often on America's Sweethearts' website, to see what's cooking. It's been quite an interesting journey for Carly Kincannon, who originally hails from the heartland of America, Indianapolis, Indiana. Having majored in opera performance at Northwestern University, Carly performed in shows aboard the Disney Cruise Line as well as in touring companies for shows such as Spring Awakening, American Idiot and Candide. Arriving in New York almost ten years ago, Carly harbored dreams of Broadway stardom. Though a starring role on the Broadway stage was not to be, Carly found something that was more impactful than fleeting fame; her true calling in life America's Sweethearts. Like so many newcomers to the big city, Carly worked hard at a wide range of jobs in order to make ends meet. This spunky and talented singer worked as a waitress, a Disney princess, a receptionist, salesperson, teacher and Edible Arrangements customer service rep. The list of Carly's jobs was seemingly endless. But all the while, Carly never lost sight of her passion for singing and putting a smile on people's faces. And that's a noble calling in a city where smiles and happiness are, all too often, in short supply. Carly met the women who would join her in America's Sweethearts when they were all working for the same talent agency. When the talent agency relocated to the West Coast, Carly, a true leader, attempted to find jobs for her fellow singers. 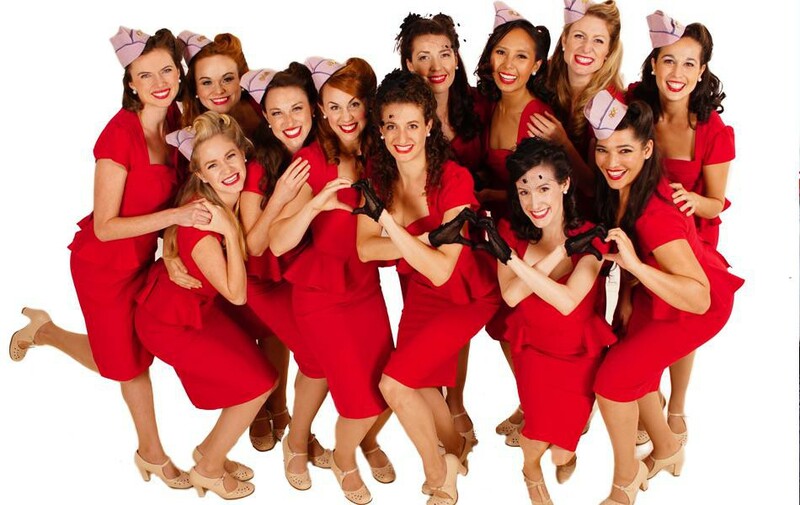 Bonding over their shared love of the Andrews Sisters and the music from that time, Carly and her colleagues decided to form a group, which, over time, grew from three women to ten. Thinking back to those days, Carly said "When I came to New York, I was just looking for that big break like so many others. I never thought that I would ever do something like this- start a company. I certainly never had any intention of getting people to work FOR me. But here we are." There is a real family vibe around America's Sweethearts. They care deeply about each other and their musical chemistry is undeniable. It shows in each and every performance. Carly has redefined just what being a professional is all about. Carly's own words explain her feelings best. "I met the amazing women of America's Sweethearts while I was singing the music of the Andrews Sisters. Before starting the group I often felt out of place in New York City. The sheer size of it all, the crowds, well; it can be a little overwhelming at times. However, the moment that I met these inspiring girls, it filled a void in my life that I didn't even know I had. They welcomed me into a family filled with respect, passion and creativity." Speaking of fortuitous meetings, Carly found true love in her adopted city. She met Matt, a fellow Hoosier, who is a talented musician in his own right and the rest is history. Carly and Matt reside in Astoria, a neighborhood that Carly says "has a small town feel". Carly loves the convenience of living in Astoria, as well as the variety of restaurants and cafes. Astoria now plays second fiddle to no one when it comes to live music. 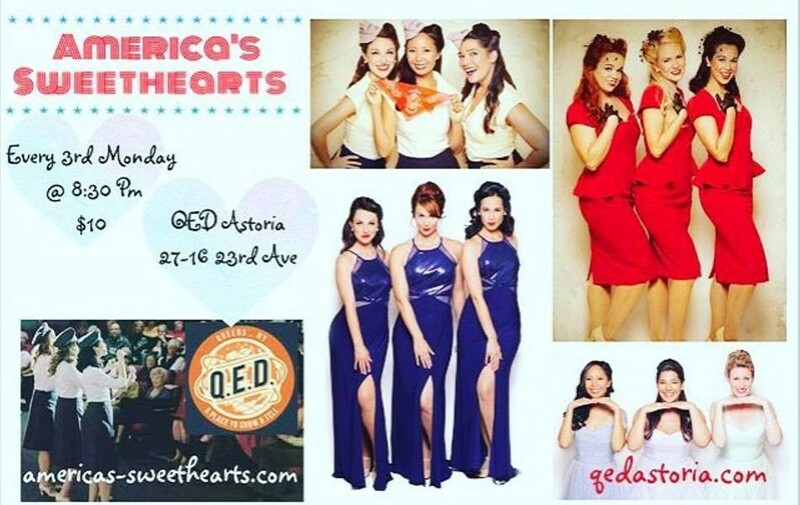 More and more venues like Q.E.D (where you can catch America's Sweethearts every month) are starting to feature local performers, which can only be a good thing. The fact that the neighborhood is only a few minutes ride to Manhattan by train is also a big plus. America's Sweethearts are in high demand across this great country of ours for performances at local concert venues and civic organizations. Their show brings people of all ages and political beliefs together. It's about celebrating America and having the time of your life. Besides being talented singers, the Sweets know how to entertain and bring a crowd to its' feet. Their youthful enthusiasm is absolutely contagious. The attention to detail is always on point. Each show includes a couple of costume changes as well as scripting that is both educational and fun. The Sweethearts can perform with either top quality music tracks or with a live band. It's up to you; whatever works for your venue and budget. You can even customize their show from the Sweetheart's extensive set list. Carly is a breeze to work with. America's Sweethearts are fast becoming a hot item on the wedding and corporate events circuit. Sure, it's nice to have a classical duo or pianist provide background music for your cocktail hour. But let's be honest, a violin and cello don't really give you the wow factor that your guests are looking for. A high-powered performance by America's Sweethearts, though, will engage your guests, no matter how good those passed bites of prosciutto and melon are! The musicians who entertain your guests should be as unique as you are. Why go to all the trouble of putting together a very personal wedding experience and then settle for the same type of music that your guests have already heard at all the other weddings that they have attended. Hiring America's Sweethearts to perform at your next corporate event or party will certainly make for a refreshing change of pace. Carly's words sum it up best. "The women in this group are remarkable human beings, who happen to be some of the greatest talents New York has ever seen. When the Sweets are not on tour, you can find them on Broadway, starring in regional theater or in the recording studio working with some of the biggest names in pop, today." "We are family. And I know that, if we choose to work together, you will see what I mean. I hope that you'll welcome us into your family". Book now and take a musical trip through time with America's Sweethearts. Hold on for the ride of your life because history class was never like this.